Liu Rongyan was born in Wenan, Heibei in 1949. He is an academic of the China Artist Association, the assistant curator of Heilongjiang Art Gallery, and first-level artist. His works were selected in art exhibitions many times at both home and abroad. Many paintings have been collected in Chinese Art Galleries and memorials. He won the copper award of the fifth China Ownership Stamp Exhibition. Huang Ming was born in Zhenjiang Jiangsu in May, 1957. 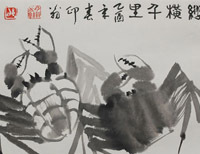 He is a member of the Chinese Calligraphers Association, vice president of multi-habitat International Artists Association, director of the Beijing Forbidden City Painting Research Society and vice president of Heilongjiang Province Seal Research. His other titles include director of Heilongjiang Old Artists Association, proprietor of China Gulong Press, prior of Harbin Sun Island Painting and Calligraphy Institute, curator of the Sun Island Art Gallery and national level artist. Zheng Yi was born in Harbin in 1961, and graduated as an Oil Painting Major from Lu Xun Academy of Fine Arts in 1985. He was vice-president of the Harbin Art Academy, president of the Harbin Artists Association and vice-president of Heilongjiang Artists Association. He is a researcher and professor of Tsinghua University Institute of Fine Arts, professor emeritus of Russian Repin Academy of Fine Arts, member of the China Artists Association and director of the Chinese Oil Painting Society. Cao Xiangbin was born in Harbin in May, 1960. She is the vice president of the Heilongjiang Province Painting Institute, and artist at the first national level.